I have a giant roll of corrugated cardboard that I have used for several projects. 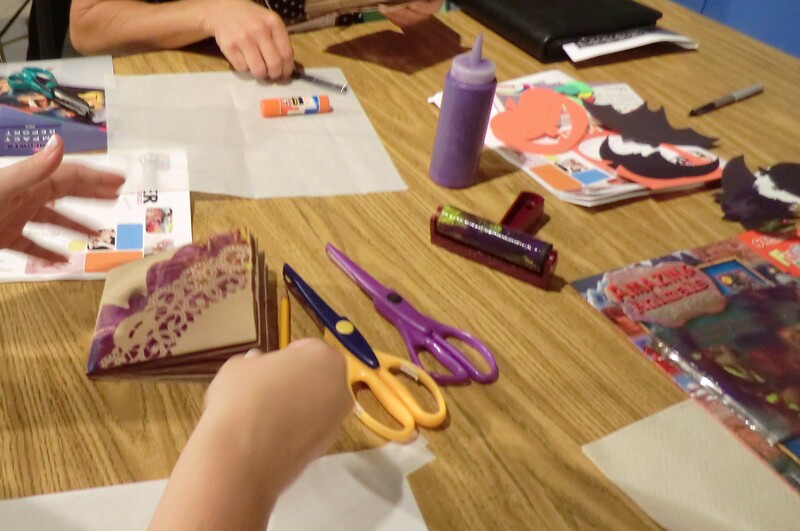 I also love collage and mixed media so when I saw this project on April Cole’s Studio blog, I knew my students would love to try it. Of course, they were allowed creative freedom. I did show them how to roll up a bit of newspaper to make the stem of the leaf. We talked about shape and color and adding power words to their art if they wanted to. They told me it would have been easier to have the power words pre0cut to save them time looking through magazines. Years ago, my parents were members of Save Our Heritage Organization (SOHO), a group of individuals who work to preserve historic properties in our community. My parents had a book called Images of American Architecture by Robert Miles Parker. they also have a lithograph by the artist. Those pieces were always favorites of mine. Remembering the images drawn by Miles Parker, I did this line drawing lesson with my students. Students looked at line drawings and photographs of Victorian houses. We discussed architectural components and they created these images in pen. I have a couple of groups of 4 year old preschool students. Some of them were in class with me last year. 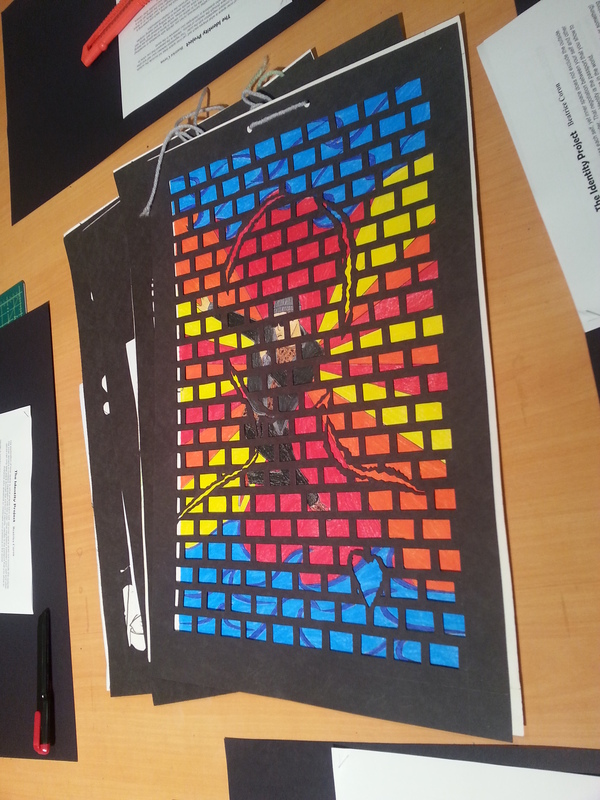 For this lesson, I started with the group that has 9 returning art students. 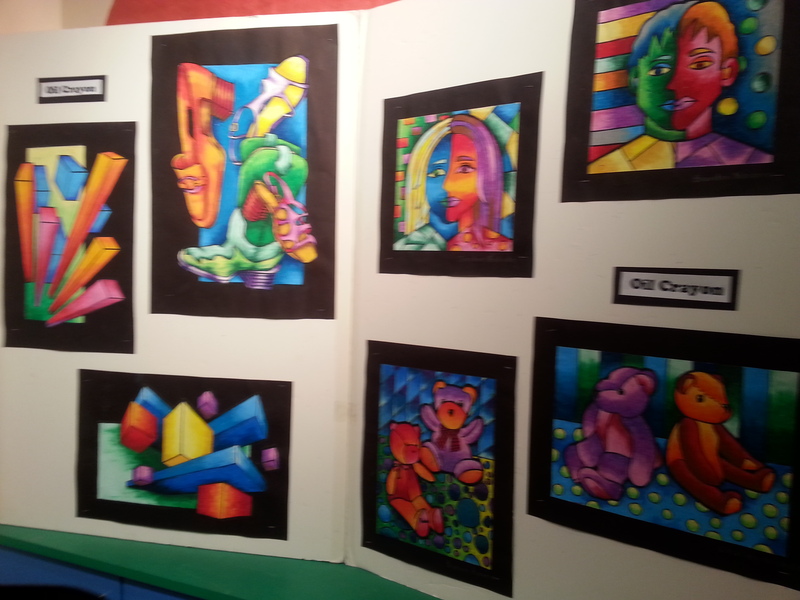 They are a very capable group and created some amazing art last year. 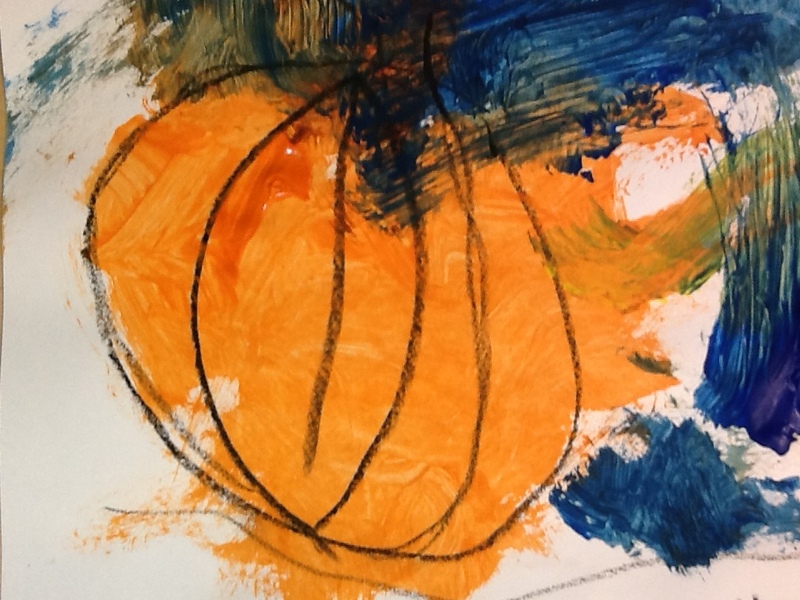 I directed the students in drawing a pumpkin: A BIG circle with curved lines (or “c’s” as the kids pointed out) and a stem. 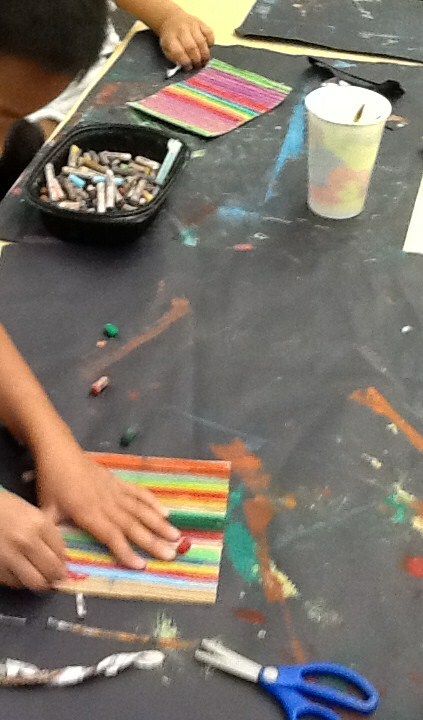 They drew a horizon line and then they painted with orange and yellow paint. Once the pumpkin was finished, they painted the sky blue and the ground gree-though they could have painted it brown if they wanted to. I knew they were very capable. They really created some amazing pumpkins. This is one of my favorites. This child created a crook necked gourd that he saw on the pumpkin patch field trip the class took the day before. I LOVE this kind of creativity! And this little child came in a few minutes late but still managed to create an awesome pumpkin! 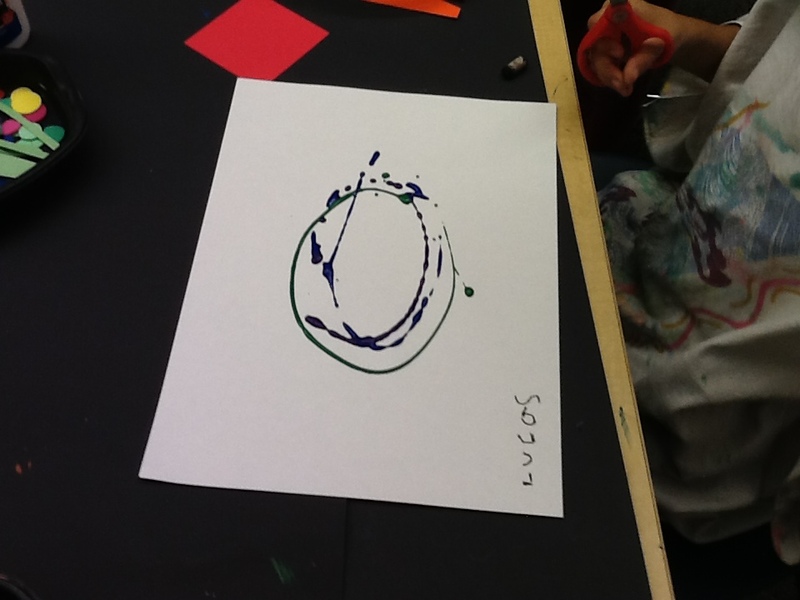 The Kindergarten students have been learning about color and mixing paint so we did these splat monsters. I have seen similar lessons done many different ways over the years. This is our version. 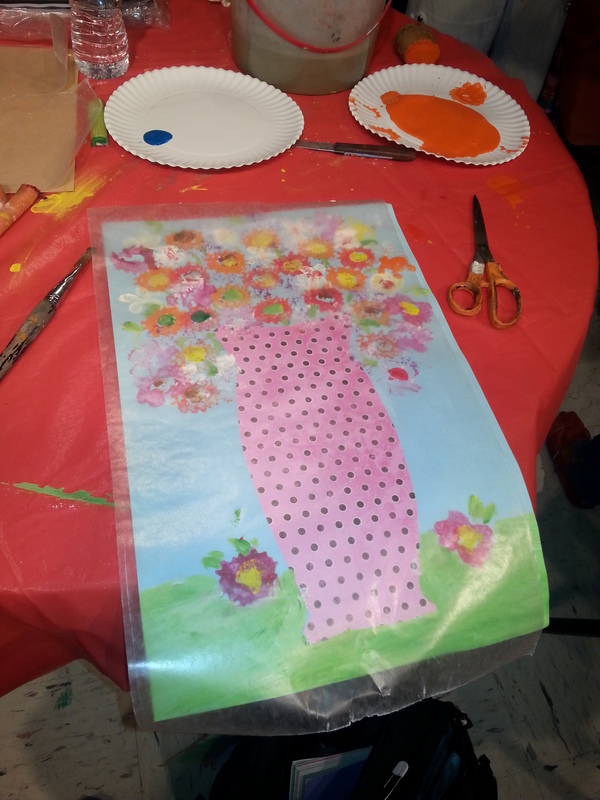 It also helped use up some of the foamies that were donated to the art room. It made a very tiny dent. I still have a huge plastic bin of foamies. 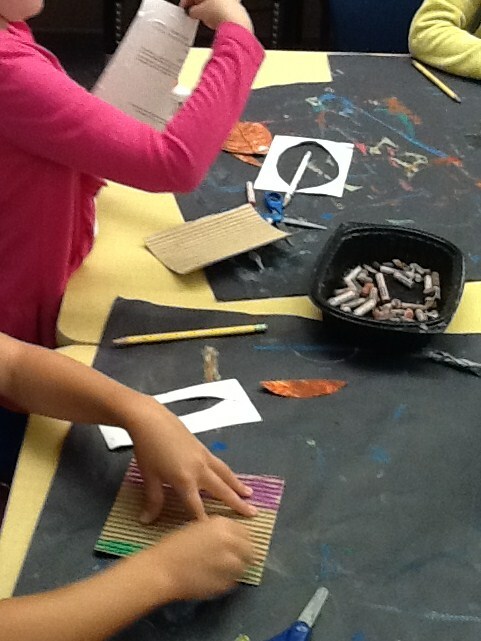 Students were given scraps of paper, a black oil pastel, scissors and glue. they were instructed to make their monster parts-eyes, horns, noses, mouths, etc. and place them in their bin. Those are the black trays that are seen in the photos. They are Lean Cuisine trays that I wash and reuse. I walked around the room with paint in a squeeze bottle. They could choose warm colors or cool colors for their monster. On this day, every class came with a helper so one of us had the warm colors and the other had cool colors. 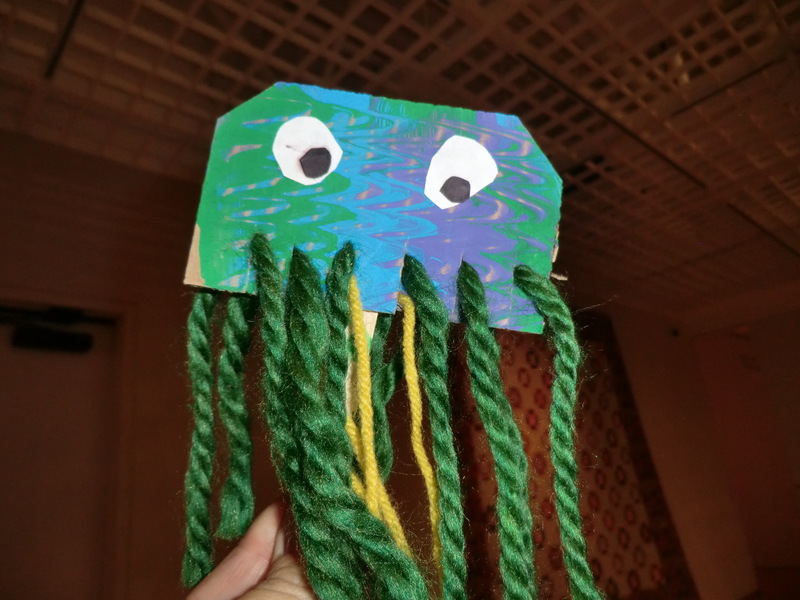 As soon as they had paint on their paper, they stopped making monster parts and folded and squished the painted paper until the paint was evenly distributed or it looked the way they wanted it to. 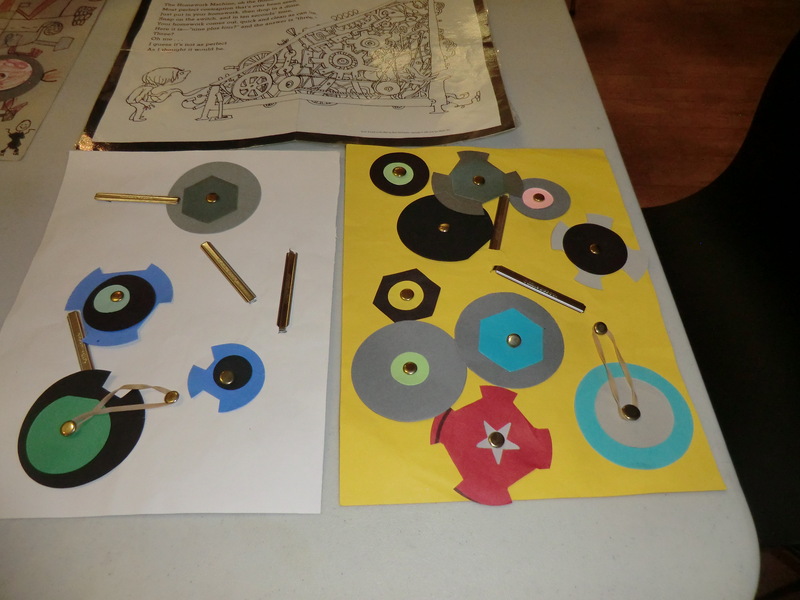 They then glued the parts onto their monsters. Super fun and pretty easy 30 minutes lesson. 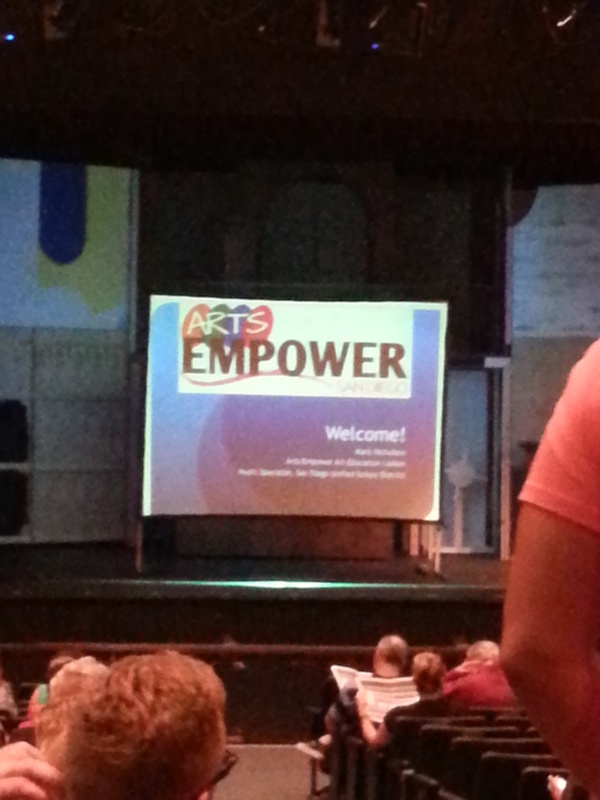 October 9 was the San Diego Mega Arts Empower Conference for VAPA teachers. This is year 2 of the conference and it is actually a lot of fun. It was held in Balboa Park both last year and this. There were just over 500 people in attendance. It is a little tricky to find all the locations of the sessions as they are spread out all over the park and not all of them have clear signage. It was nice this year that the museums allowed us to go in for free but I found it impossible to get to a museum AND the sessions so I did not see the benefit in that idea at all. It would have been nice if the museums had given the teachers a voucher to come back on another day. The opening session featured Siddharth Moran, Mark Doolittle and Ben Vereen all of them discussing how the arts fostered their success. I missed most of that session to set up my book making session all the way across the park. They had vendors in a room near Panama 66 at SD Museum of Art. I only got there at lunchtime. It was packed and the tables were really close together but I did manage to get around to all of them and gather up some ideas and brochures. There were many sessions to choose from for all areas of VAPA. I chose to attend Visual Arts sessions, of course. 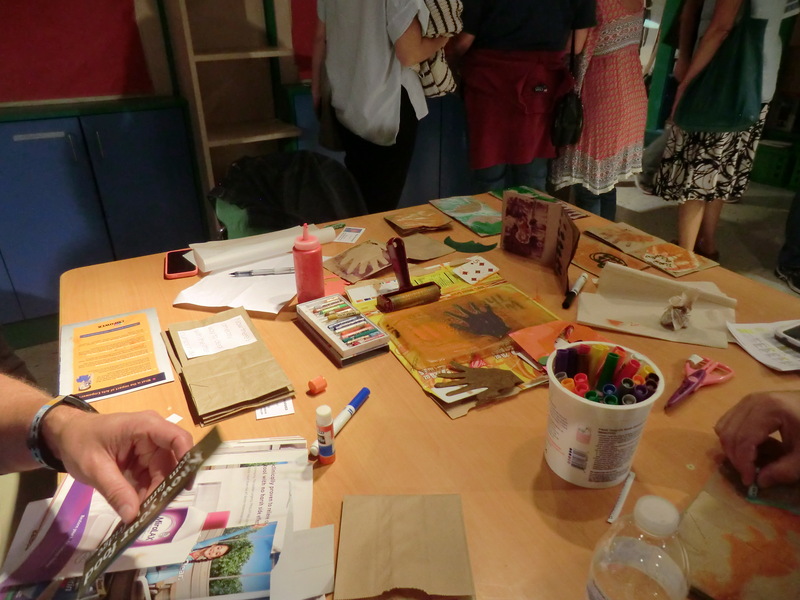 I also prefer hands-on sessions where I can touch things and get ideas and lessons to take back to my students so those are the sessions I chose to attend. Here are some images from the sessions I visited. I see some new art lessons for my students in the making! Puppets made with scrap cardboard. This reminded me of the hearts I made with the preschool 3’s last year. 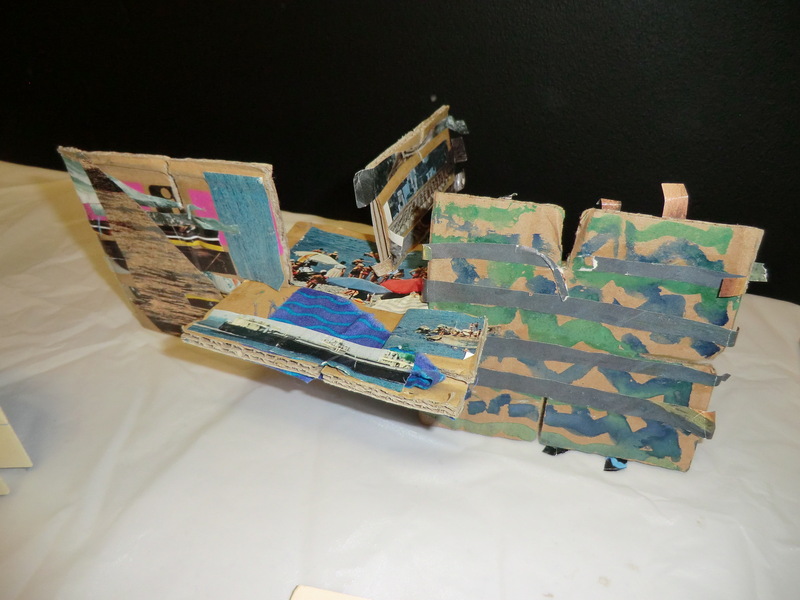 Scrap cardboard sculpture-slotted squares of cardboard decorated and notched to create a changeable sculpture. 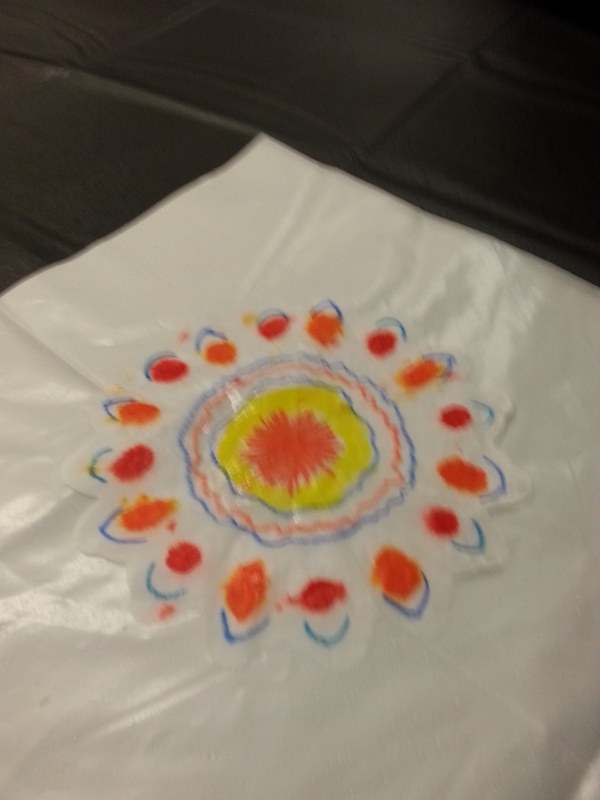 Crayon resist (hydrophobic) flowers with dampened marker (hydroponic). 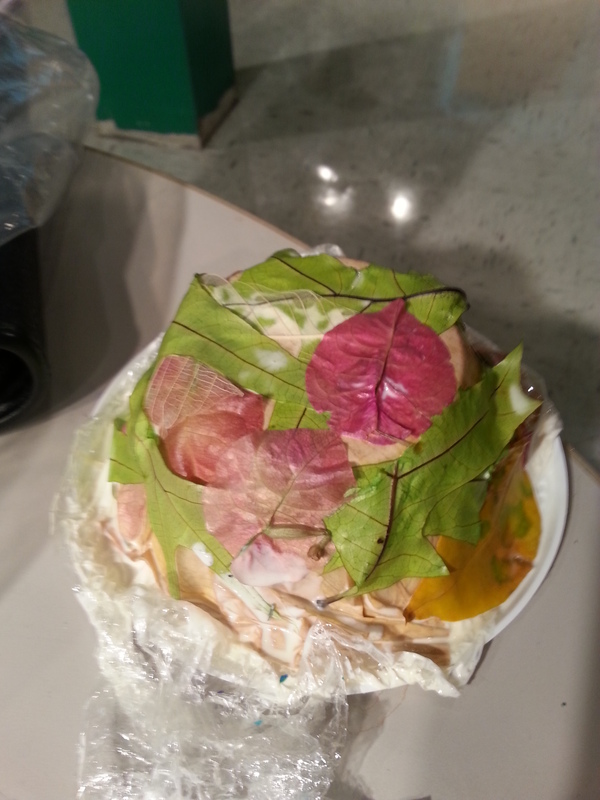 Paper mache bowls with tissue paper and botanicals. 3D Images in chalk-uses chromadepth 3D glasses for viewing but nice as a stand alone image as well. LOVED the giant black chunky crayons she had. She said they were from Nasco. 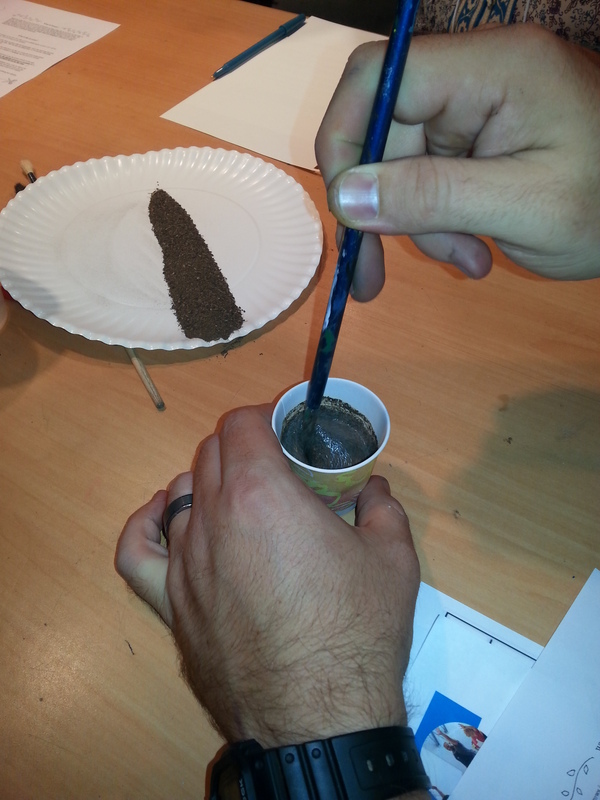 Painting with dirt…glue, water and strained dirt used as paint. Interesting concept. Not sure my principal would appreciate the students digging holes all over the school yard to bring in dirt to make paint but certainly a fun lesson. Machines that move. Oh I think some grade 2’s are going to love this lesson! The layered self. I would use clear acetate instead of the cut paper or the cut images would be far less elaborate and done with scissors and symmetry instead of using the box cutters and exacto knives this high school teacher uses. 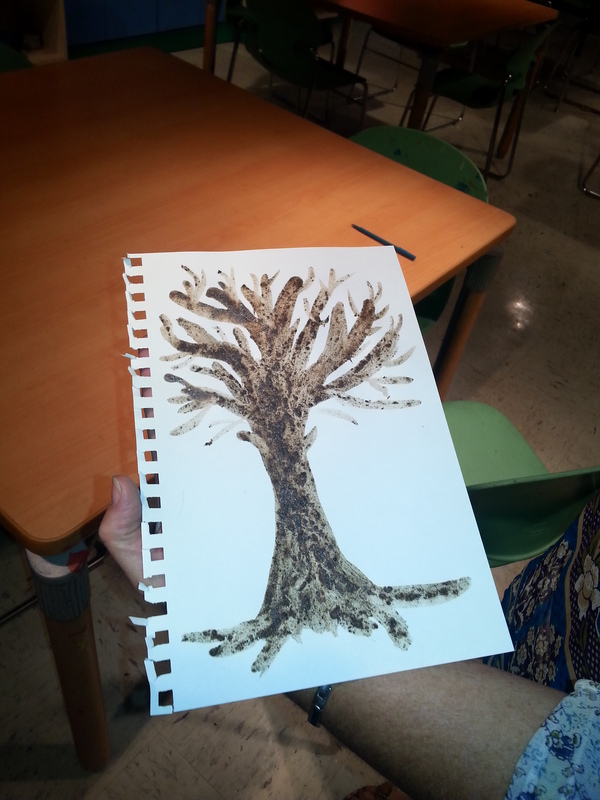 Vegetable print making-I pretty much knew what this one was before I started but it was next door to the dirt painting session so I straddled the two and got the best of both workshops. The teacher for this one came all the way down from Fallbrook! There were so many ideas and thoughts on arts integration, STEAM, best practices, National Standards and Common, Core. It was a splendid day and a great way to meet teachers from all over the county. I presented a workshop at the MEGA Conference for VAPA teachers on October 9 and neglected to bring any handouts and forgot to put the recipe I use on my slide presentation. So, for anyone who would like it, here it is. This is not my recipe. I got this one from the frugal crafter. Mix it thoroughly. Other posts I have read stated that they had problems with gooey and gloppy messes. I never have. Pour into a pan. 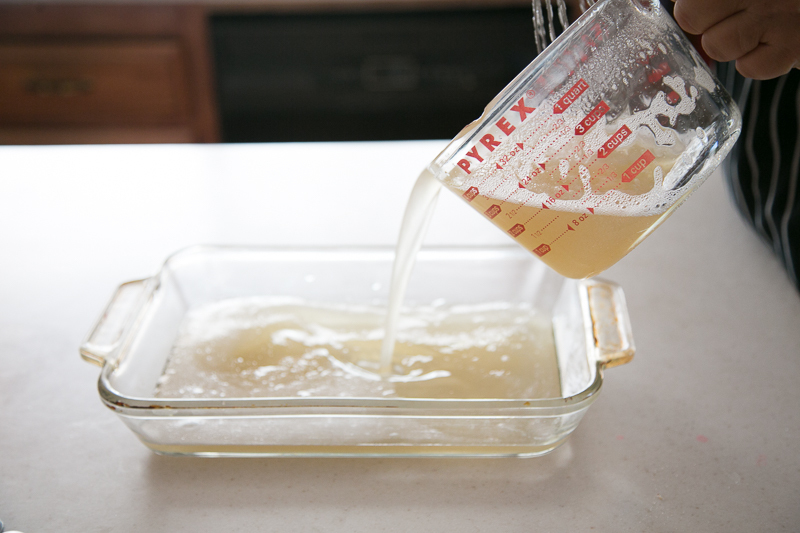 I used a 9×13 glass baking dish. Allow to set. I find that it only takes a couple of hours. 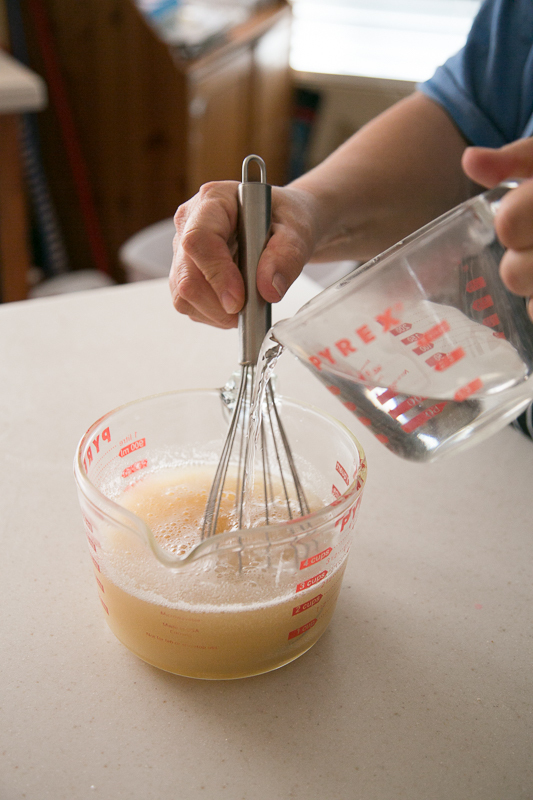 Be sure to skim off the bubbles with a paper towel or napkin to make it smooth. Te remove from the pan, run a butter knife around the edge of the pan. the plate should lift out fairly easily. Just be gentle to avoid tearing it. I have several plates that are a year old or more and well used by students. I noticed that one of them was pretty nicked and had a large tear. Before the conference, I just cut it into small pieces with kitchen scissors and placed it in the glass baking dish. I put it in the microwave and microwaved it for a minute or two until the gelatin re-melted. I let it set and it was good to go. 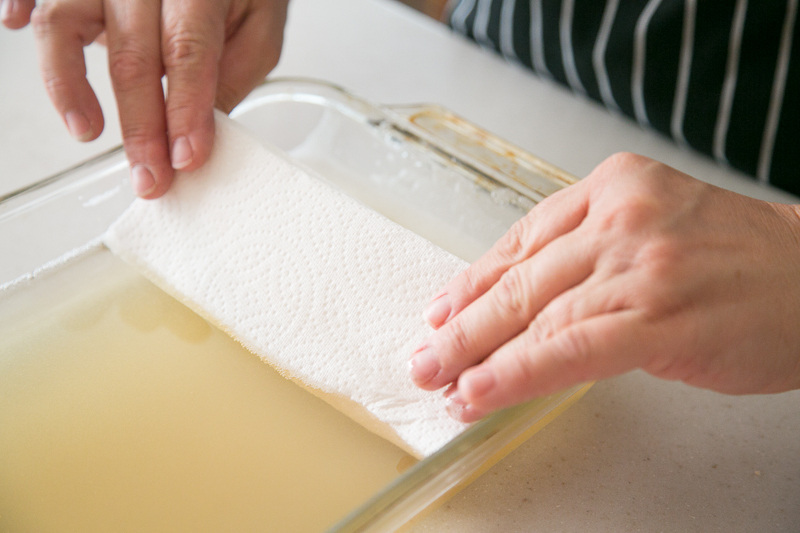 To clean the plates , simply wipe off or a quick rinse with cool water can also work. Just note that cooking plain glycerin does not smell very good. If you have ever made homemade marshmallows, you know that smell. Once set, there is no odor. It is just the mixing with water that brings out the smell. Here are some images from the Mega Conference. I think they enjoyed it even if I did talk too fast, did not bring handouts and forgot the recipe.